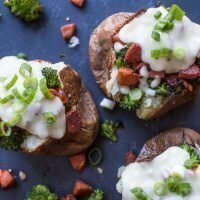 Chorizo roasted broccoli cheddar overstuffed baked potatoes. Change your lunch game forever. 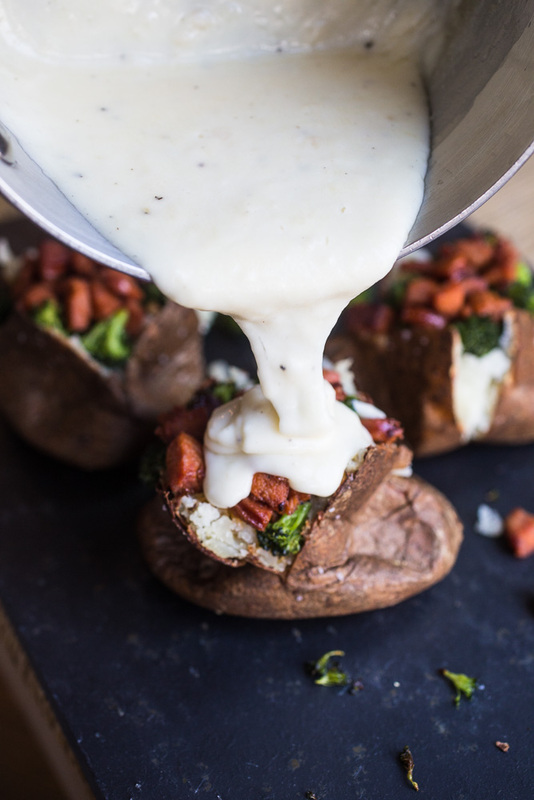 Hello cheese sauce-smothered baked potatoes stuffed with all kinds of good things! I talked a few weeks ago about a new and brilliant way to bake up the perfect baked potato with the fluffiest interiors and crispiest skins. Phenom. Seriously, it will change your life! Two weekends in a row I cranked up the oven to bake those potatoes and both times, it was for only this recipe. 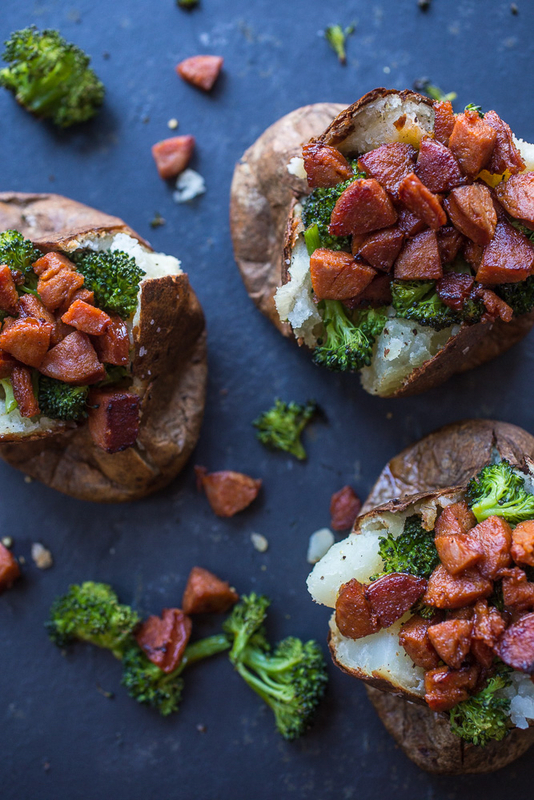 Chorizo roasted broccoli cheddar overstuffed baked potatoes. With that pool of cheese sauce sitting on top and a light sprinkle of scallions? How can this be wrong? Well, it’s not. Everything about these potatoes is alllll right. And at this point, I can’t get Matthew McConaughey out of my head…alright alright alright!! The idea for these overstuffed baked potatoes came to me out of that ever-present issue of finding things in the fridge that I didn’t know we had. Like broccoli. How does a head of broccoli get lost in the fridge? And how did I forget that I bought said broccoli?? And chorizo? That one lonely link I tossed in a zip-top bag then into the freezer a couple of months ago? Sad, forgotten about chorizo! I always have cheddar on hand so the cheese sauce for these potatoes was sort of a no-brainer. And with that, lunch was solved pretty easily! And can I be completely honest? We completely scarfed these potatoes down. Toasty broccoli, zippy chorizo, and a 5-minute sharp cheddar sauce all smushed inside tender, fluffy, crispy-skinned baked potatoes made for an outstanding lunch. If you add a side salad or a small bowl of soup, you can easily round out the meal for a filling dinner. Either way – lunch or dinner – you need these potatoes in your life. STAT. 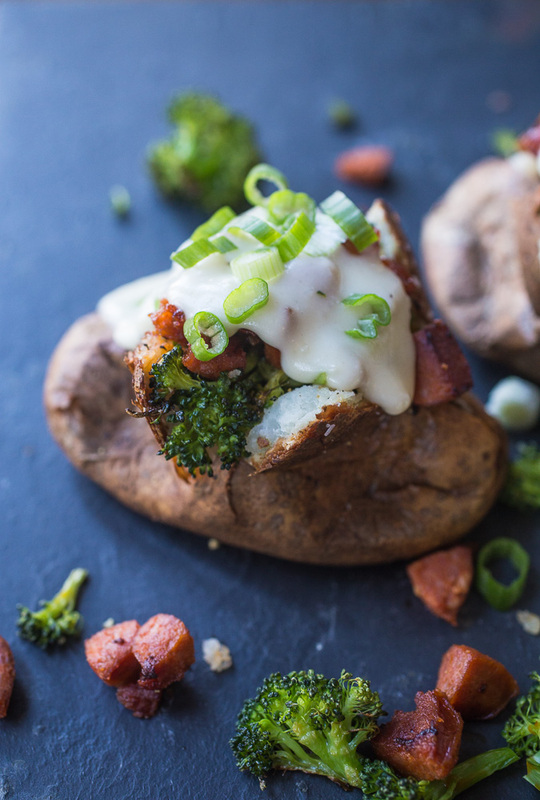 Change your lunch game forever with these chorizo roasted broccoli cheddar overstuffed baked potatoes. 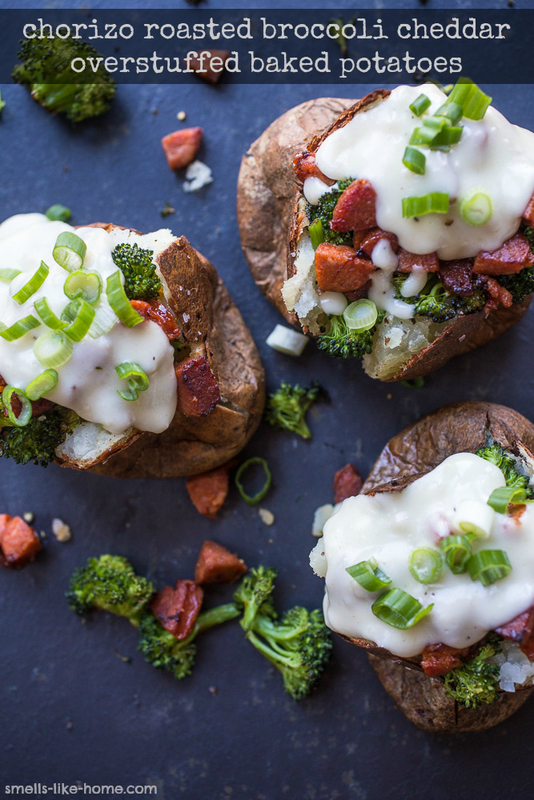 The key to these stuffed potatoes is to time roasting the broccoli with the end of the potato baking time. So, when there are 10 to 15 minutes left of the potato baking time, on a baking sheet, toss the broccoli with one tablespoon of olive oil and a sprinkle of salt and pepper. 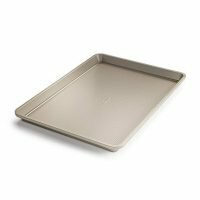 Roast for 10 to 15 minutes. After the broccoli goes in the oven, melt the butter in a small saucepan over medium heat. 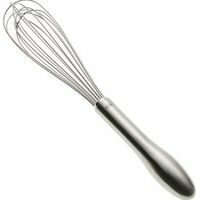 Sprinkle the flour over the butter and cook, whisking, for 1 minute. Slowly whisk the milk into the butter-flour mixture until no lumps remain. Simmer for just a couple of minutes until the milk thickens and starts to bubble. Remove from the heat, stir in the cheese until melted. Season with salt and pepper to taste. Lastly, heat 1 tablespoon of olive oil in a small skillet over medium heat. Toss the chorizo into the pan and cook until browned and warmed through, about 3-5 minutes. If the cheese sauce and chorizo are finished before the broccoli and potatoes, you can heat them back up over low heat when you're ready for stuffing. 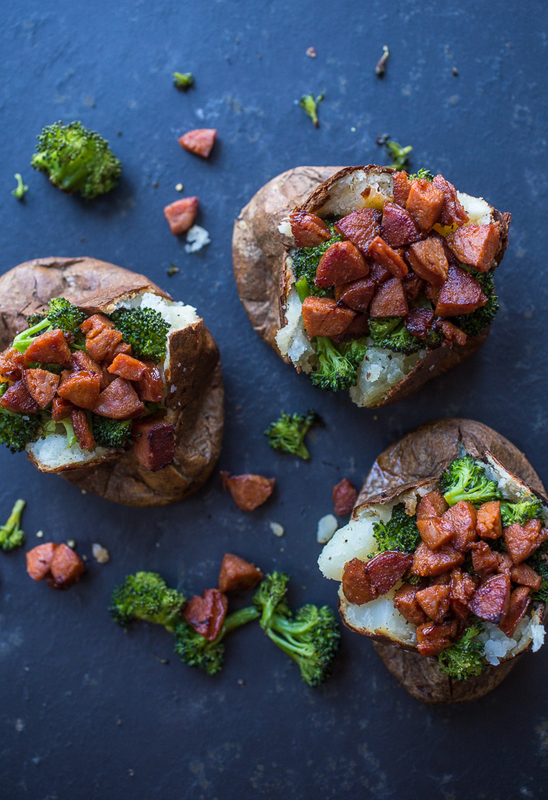 Once potatoes are finished, split them open immediately and add a pat of butter and some salt and pepper to each (if desired) and divide the broccoli and chorizo between each of them. Pour the cheese sauce over the top of the potatoes and top with some chopped scallions. 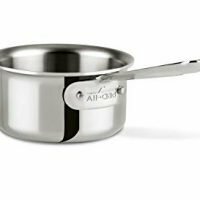 Serve while still hot.